Previously on The Borgias: Lucrezia and her husband escaped from Naples, only to find themselves essentially prisoners again in Rome. Cesare and Alexander finally buried the hatchet, with a serious assist from Mattai, and Cesare was given command of the papal armies. Machiavelli lays a fire and talks with Cesare about the perfect crime. Cesare thinks it’s one without a victim, but Machiavelli says it’s one without a suspect. Thus, he thinks the killing of Juan was a perfect crime, and that the man who carried it out might one day make a great prince. Cesare counters that a prince needs a principality, which Machiavelli well knows, which is why, he figures, Cesare has come to chat with him about Forli. Cesare asks what Florence plans to do about this little tiff with Caterina and Machiavelli says Florence is staying well out of it. Cesare says his army needs to cross Florence to get to Forli. Machiavelli advises him to do so at night, so they can disavow any knowledge of it. But armies make a lot of noise, he adds. Cesare promises they’ll be quite as churchmice. Machiavelli says that’ll be difficult, what with two whole armies on the march, but Cesare smiles and confides that the French army is already at Forli, well beyond Florence’s borders. And now we get to see them marching through the forests of the Romagna, dressed in leaf camouflage. Clever. Cesare tells Alexander he plans to send the papal army ahead of him and then follow a bit later. Alexander’s surprised Cesare doesn’t want a cheering crowd to send him off, because he doesn’t yet completely understand that we’re not dealing with Juan anymore. 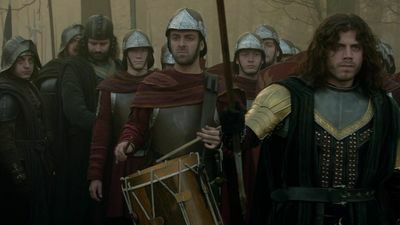 Alexander worries about Florence but Cesare sets his fears at rest and once again promises to carve him out an empire. This puts Alexander in another frame of mind: he muses that things would be so much easier if, instead of mucking about with conclaves and such, the power of the papacy was just handed down from father to son. Cesare is astonished and tells his father that such a thing would never be tolerated. Alexander knows it’s nothing that can happen overnight, but if they create this kingdom Cesare dreams of, he might be able to work something out, and keep the kingdom and the papacy in the Borgia family forever. Cesare gets suited up in his armour and reminds his Band of Bastards of what happens to those who betray him. Vitelli says they heard him loud and clear, so he has nothing to worry about there. As they go out to greet the troops, Cesare tells them to keep the troops under control while they march. There’s to be no pillage and no nonsense. They reach the troops, who hold up their swords in a ceremonial arch for Cesare to march through, holding up his own sword. So, I guess he’s not against a little bit of flair before hitting the road. The BoBs exchange a bit of ‘well, I guess we’re all in this together now’ before following him. Off marches the papal army, and seen from the city gates, it’s pretty massive. Alexander must have really gotten to work putting that back together after Juan got it nearly wiped out. As it marches, Ruffio watches the army leaving the city gates. Cesare, meanwhile, goes to visit Lucrezia, who warns him that her husband knows something, but that doesn’t stop her from getting really up close and personal with her brother for a bit. He plays along, but then remembers what they’re doing and pulls away. Lucrezia observes that he’s spent years pulling away from her, and she’s as tired of that as she is of her husband and her life. The only thing she’s not tired of is Cesare. She wonders why they’re cursed with this love for each other, which seems so natural and good, but is seen as very, very bad by the world at large. She starts talking about how overwhelming it is, as she begins panting in a slightly disturbing way. 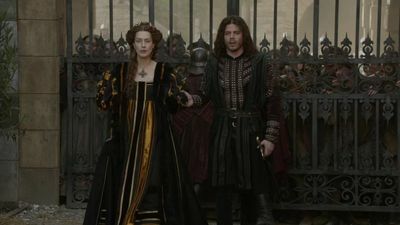 Cesare tells her he has to leave, and she pulls herself together, rather jealously talking about his army and the castles he needs to knock down. She comes over to him and begs him to think of her. He holds her close and asks her what could console her. She thinks another child could (because babies fix everything, right?) but apparently Alfonso’s only capable these days when he’s drunk. That’s…unusual. And speaking of drunken Alfonso, he comes stumbling in now, disgusting his wife, and asking Cesare if he can join his army. ‘I think we can all agree I’m useless here, but I can wield a sword,’ he says, drawing his weapon. He advances on Cesare, who swiftly disarms him, tells him to sober up, and they’ll talk about joining armies later. Cesare goes to his mother, who holds him consolingly as he says he wishes she could fight and admits he misses Micheletto, who knew him so well. Nice to hear him giving Micheletto his due. Kind of out of nowhere, Vannozza brings up the fact that she used to be a whore. Cesare corrects her and says she used to be a courtesan, and he won’t be the son of a whore. Her point is that they’ve come really far, thanks to Alexander. They start to talk about Alexander and Cesare says he has many ambitions, which he can’t even bring himself to speak of, because they scare him. She’s surprised to hear him talk about fear, but he tells her he has many fears, most of which focus around Lucrezia. He asks his mother to keep her safe, because he doesn’t trust her husband to do so, that’s for sure. He darkly tells Vannozza that Rome’s about to change. ‘Not again,’ she sighs. Ruffio rides hard back to Forli and tells Caterina that the army is marching from Rome. She says that means they have 10 days to prepare for the siege. Except they don’t, because the French army’s already there and taking positions just outside Forli. Inside the castle, Caterina gathers her lieutenants and starts laying out siege plans, which include clearing the forests so nobody can hide and digging trenches. Meanwhile, up on the battlements, the forming soldiers have attracted notice. Ruffio runs in slow motion (again with the slow motion!) to Caterina’s room, interrupting the meeting, and takes her up to the battlements to see the army. In some despair, she observes that they’re already under siege, and winter is coming. Just to underline the point, the French fire a cannon right into the city walls. Cardinal Sforza interrupts a meeting Alexander’s having with Cardinal Farnese to tell him Cesare’s army has reached Forli. Alexander’s response is basically, ‘wow, that was fast.’ Several Italian ambassadors are now demanding meetings with Alexander, who tells Sforza to direct them to Cesare. Sforza asks where he is, and Alexander claims not to know. Cesare’s upstairs, asleep, until his dad wakes him up and says, mildly, that it would have been nice to have a head’s up about the French army’s movements. 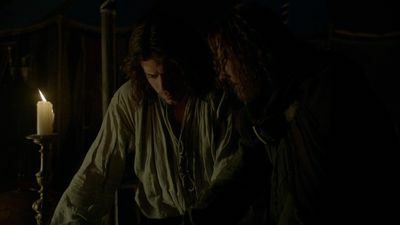 Cesare asks if he’d rather know or be able to genuinely plead ignorance, and Alexander admits he’d rather not have to lie to people, whenever possible. He warns Cesare that the French will probably want to claim Naples again, in return for their help in this conquest. Not that Alexander cares, as long as Lucrezia can be spared any future ‘discomfiture.’ Cesare gets up, dresses, and tells his father he was never there. Alexander agrees and tells his son to remain invisible. Cesare rides toward the Romagna to join the two massed armies now there. Along the way, he secretly meets with Machiavelli, who tells him Florence is, as promised, looking the other way as the armies march past. Cesare asks him for another favour: he wants him to pass along a message to the French king that, once Cesare takes care of Forli, he’ll take Naples, and when he does, he’d like Lucrezia to act as the French king’s regent there. He promises that Lucrezia is the most capable person he knows. Machiavelli asks if her husband has a role in all this, and off of Cesare’s silence, realises he shouldn’t have asked that. Forli’s being bombarded mercilessly, as peasants etc. huddle inside. Cesare arrives and slow-mo rides past the armies so they can admire his luscious, luscious hair. He tracks down Vitelli and asks him why they’re preparing siege towers when they have these nice, shiny cannons pounding away. Vitelli reminds him that Forli’s walls are 12 feet thick, so they might need a backup plan. Inside, Ruffio finds Caterina, flopped next to a sad little fire, and urges her to eat something. She’s not interested, because she’s fast losing her will to live. Ruffio tries to reassure her that all is not lost, but she knows that’s not really true. They’re safe behind the walls, yes, but they’ll slowly get starved out. She makes him promise not to let Cesare take her alive, if the city should fall. She also tells him he should consider his future, if he survives, and says he could do worse than to throw his lot in with Cesare. In the middle of the night, Cesare wakes to find Micheletto at his bedside. YAY! He asks where Micheletto’s been and Micheletto says he’s been talking to God, but hasn’t heard anything yet. Aww. He’s come back, just briefly, to do his old boss a solid. Reminding Cesare that he was born and raised in Forli, he shows him where there’s an old mine that runs underneath part of the city’s walls and the main gate. It’s the place’s big weakness. And that’s going to be it for him. Cesare tries to get him to stay, but Micheletto’s done. He bids Cesare farewell and goes. I miss him already. Cesare and an engineer find the quarry and discuss what to do next. The engineer starts pacing it out and figuring out directions, so they can get this strategy right. I find it rather hard to believe that 1) any part of the city’s walls would have been built over such a weakness, and 2) that nobody else would have known about it. Caterina’s smart, she should really have someone guarding this thing at all times. But no, apparently this is something known only to Micheletto. In real life, there was no such quarry. Cesare’s army just bombarded the walls until they finally fell. Cesare gets ready to put his plan into action. Up above, the engineer tells him to walk exactly 248 steps from the edge of the forest. The BoBs doubt this is going to work, but Cesare tells them to chill. Grabbing a white flag and trailed by soldiers, he approaches the city as Caterina grabs a crossbow and aims it at him. She threatens to kill him, so he reminds him that she can’t, because he’s under a white flag. She doubts that matters much to a Borgia, and he reminds her that he’s not his brother, to whom the white flag meant nothing. She points out that Cesare still killed her son and he defends himself by saying the boy was under arms, but there are thousands in the city who aren’t. He plants the flag and lays out his terms: surrender the city and herself and he’ll spare the populace. She refuses to bow to the ‘whoremaster of Rome’ and looses her arrow. Her men follow suit, peppering the ground at Cesare’s feet with bolts. He retreats into the midst of his soldiers, who form a barrier with their shields and return to their side. 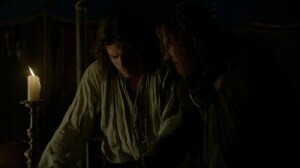 The engineer tells him he got it just right, as Cesare and the BoBs go to the guns. Vitelli confirms that they’re aiming to strike the ground in front of the castle, not the castle itself, and warns Cesare that they’ll be laughed at. Like he cares. Aiming for the flag Cesare so thoughtfully left behind, they let loose a cannonball from their giant new gun. As expected, it falls short of the castle itself, and the men on the walls laugh and jeer. The next few shots land in the same place, and there’s more jeering. Caterina laughs, because she doesn’t know that the roof of the quarry beneath them is beginning to crumble. A few more shots, and the roof collapses entirely, opening up a giant chasm in the earth and crumbling the wall above it. Nice work, SFX folks. It’s a pretty spectacular scene. Soldiers flee the collapsing wall as Caterina’s face falls and she starts to look genuinely afraid. Cesare’s men cheer and he tells his men to go ahead and attack. Through an atmosphere thick with stone dust, the army charges, soldiers pouring through the crumbled wall by the hundreds, as the terrified populace screams and flees. Soldiers fall, a little kid almost gets trampled, there is some slow-mo running (of course). People take refuge in the castle itself, huddling behind the last of the soldiers. You really have to admire their loyalty and Caterina’s ability to inspire it. They’re really sticking it out until the bitter end. Cesare calls off his soldiers, telling them he doesn’t want a massacre. 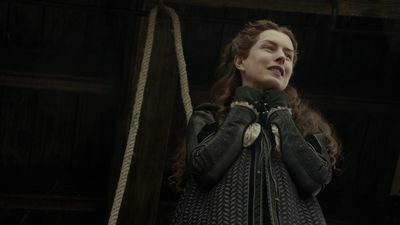 Suddenly, Caterina appears on an upper balcony, a rope wrapped around her neck, and yells for Cesare to give her a legendary death. Cesare tells Bagnolini to aim his gun at the rope. Caterina laughs and throws herself off the balcony. Bagnolini fires, severing the rope at just the right time, and Cesare dashes forward and catches her before she hits the ground. ‘Damn you, Spanish half-breed,’ she gasps. Cesare chuckles and tells her he doesn’t want her dead. Some time later, she’s trussed up inside, held by chains hung from the ceiling in her bedroom. The door opens to admit some maids with a lovely black and gold dress, followed by Cesare, who undoes her shackles. ‘I should have stabbed you on this bed,’ she says wryly. He says they both know that now. He says he doesn’t want her seen in public looking such a mess. He’s tamed a great tigress, and he wants her dressed appropriately. Cesare tells his men to prepare a golden cage for her, lined in black satin, like a hearse, and pulled by liveried and feathered horses. He wants her entry into Rome to be spectacular. Unlike Juan, Cesare prefers to have his laurels after he’s actually earned them. After that, he’ll take her to Castel St’Angelo. Cesare pauses beside Ruffio, who’s being marched out of the city, along with other prisoners. Eyeing him, Cesare asks his men to confirm that Caterina had an assassin, and he’s now one of the prisoners. He asks that Ruffio be sent along to him as well. Now magnificently dressed, Caterina emerges from the castle and is met by Cesare, who asks her to take his arm. ‘this is my wake, not my wedding,’ she sniffs. He gently urges her to take it, as she did once before, and she does, for the last few steps to her literal gilded cage. Wow, they got that thing put together quickly. Her arms are made fast with golden chains, and she’s on her way back to Rome, to pay homage to the pope she hates so much. Caterina and the army reach Rome, where it seems a pretty good percentage of the citizenry has turned out to gawk. There’s no cheering, interestingly enough. She clearly has their respect, at least. 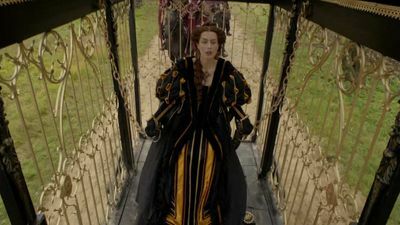 She’s taken to the Castel, where Alexander joins her in her cage and tells her things would have been a lot easier if she’d just come to him of her own free will, like he asked. She shrugs that the outcome probably still would have been the same, and then asks if she’s going to be tortured. Alexander promises they have nice rooms prepared for her, fit for her station, with a beautiful view of St Peter’s. Heh. Cesare, meanwhile, goes to have a chat with Ruffio. He tells him he had a man like him once, capable of any job, and he’d like to have someone similar to take his place. He offers to set Ruffio a task to see how he performs. Lucrezia meets with her father in the confessional, because she figures it’s the only place Cesare’s spies can’t follow her. She asks her father flat-out if it’s true that Cesare plans to go after Naples, knowing that, if it is, her husband’s days are numbered. Alexander’s silence is all the answer she needs. Back with Cesare, he tells Ruffio he needs someone done away with: Alfonso of Naples, his sister’s husband. Followed by Ruffio, Cesare arrives at Lucrezia’s palazzo and sends the guards away. He wanders into the courtyard, calling for Lucrezia, and is met by Alfonso, who says that Lucrezia is indisposed. He asks if Cesare’s come to release him, finally, and Cesare says he has—Alfonso is free to wander the city, alone, whenever he likes. ‘The way your brother went? An anonymous blade?’ asks Alfonso dully. Poor guy knows he’s doomed. He grabs a sword and starts to fight Cesare, who disarms him and tosses him aside. Crazed, to some extent, Alfonso rushes him, and though Cesare shouts for him to stop, he launches himself at Cesare, and gets spitted on the sword Cesare’s holding. Horrified, Cesare removes the blade and looks down at the dying man, as Lucrezia comes rushing down the stairs and starts freaking out at the sight of her husband expiring in the courtyard. I thought she didn’t even really like this guy anymore? I wish there’d been a scene of reconciliation between herself and Alfonso to make this a bit more credible. Cesare tries to explain himself, but she screams for him to fetch help. ‘He’s killed me, just as you both wanted,’ Alfonso gasps as Lucrezia tries to stem the bleeding and kisses his face. A doctor is fetched, and Alfonso is carried to bed, screaming in agony. Lucrezia trots alongside, trying to soothe him. All the doctor can do is put a stick in his mouth for him to bite down on while he examines the wound. Cesare waits downstairs, listening to the man’s howls, and tells Ruffio, who’s hidden in the shadows, to wait, because he might yet need a professional. He goes upstairs and asks the doctor what can be done. Nothing, apparently. Alfonso’s doomed, but his death is likely to be a slow one. Yikes! Lucrezia, her face smudged with her husband’s blood, is half lying in the bed next to him. He begs her to put him out of his misery. She dully says she can’t. ‘Yes you can, you’re a Borgia,’ he practically spits. She kisses his face, then gets up, passes Cesare, and starts to add a powder to a cup of wine. ‘Is that all I am now, Brother?’ she asks coldly. ‘Borgia?’ ‘A professional,’ says Cesare, as she returns to her husband. I feel I should point out how much all this has in common with the scene back in season one when Djem died. Again, we have a man lying in agony (a man who kept calling Cesare brother, no less), begging for release, and Cesare going to look for ‘a professional’ to do the job. Then, the professional was Micheletto. Now, Lucrezia, who was all sweetness and light back in those days, in her pastel dresses and childlike caps, has stepped up. Some time later, Cesare goes into the bedroom, where Alfonso now lies dead on the bed, Lucrezia stretched out on top of him. Cesare freaks out, thinking she’s dead, and for a moment, I wondered if the show was actually going to rewrite history and go ahead and kill her, but no, she’s just completely drained. 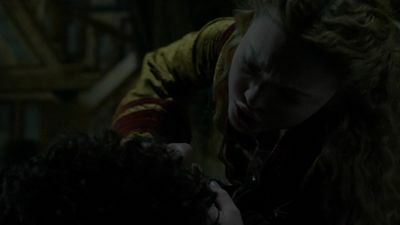 She tells Cesare she’ll never wash this blood away, so he offers to do it for her. As he tenderly bathes the blood from her face—with her dead husband lying right next to her, mind—he quietly tells her she’ll be naked, clean, and all his, once again. Well that was…incredibly creepy. That’s it for the Borgias—permanently. Showtime’s decided to pull the plug on the show instead of giving it the fourth season the creator wanted, for reasons unknown (I can’t help but wonder if Jeremy Irons’s habit of saying insane and incredibly horrifying things was part of it), which is really too bad, because this was not a very satisfying way to end the show. This was clearly intended to be a season finale, not a series finale, because although it tied a couple of things up (Caterina Sforza, in particular) it launched a few new plotlines that seemed like they might have been intriguing in the coming season. Alexander’s desire to turn the papacy into an inheritable office, for one. And Cesare’s taking on Ruffio in Micheletto’s place (and hands up—am I the only one who was bitterly disappointed we never got a Ruffio/Micheletto face off? That would have been amazing.) And Lucrezia’s total disenchantment with her family might have been interesting to see spool out. And, of course, there was never any resolution to the biggest running plotline of all: what the hell happened to Della Rovere? He just hit the road in the season premiere and was never seen or heard from again. I’m sure he was going to come back in the next season, and if it had followed history, it would have been really fascinating to see, because in real life, Della Rovere became pope very shortly after Alexander died, in part by tricking Cesare into supporting him. Seeing some of that wheeling and dealing, with all the history these two characters have together, would have been great, and highly satisfying. This season? Wasn’t the best. It had some good moments, true, and some good new characters (Mattai stands out—he was a great addition, and I enjoyed seeing him and Alexander circle each other a bit warily but also work together), but it lacked the tension of last season, which was really rooted in the family’s internal struggles and Cesare’s slow turn to a pretty dark place. Caterina was a worthy adversary, but the fight with her and especially Cesare’s struggles with Alexander were starting to feel pretty forced and drawn out. And the whole sexual relationship between Lucrezia and Cesare was something I really didn’t need to see. Let’s write our own season 4, shall we? I think Della Rovere would have come back into the picture fairly early on, gathering disenchanted cardinals to his side as they deflected from Alexander, horrified by his notion of keeping the papacy in his family. Lucrezia’s third marriage would have taken place, much to Cesare’s chagrin, while Cesare’s increasing obsession with his sister would have begun weakening him and leaving him vulnerable on Alexander’s death (which occurred in 1503). That death left Cesare extremely vulnerable, and he didn’t last too far beyond his father, dying in 1507. Della Rovere would have used his weakness to manipulate the Borgia son, and I think the whole thing would have ended with the new pope being crowned. Now that, I think, would have been a satisfying ending—coming pretty much full circle from where we started. Alas, ‘tis not to be. Thanks to everyone who followed the recaps. I’m hoping to do a little Borgias fashion special (if it doesn’t make me kind of crazy), so keep an eye out for that. Now, onward to another dysfunctional family with The White Queen! hey sorry to comment here – just wanted to know if you have seen the white queen and would be reviewing? Hi Katie! I have seen the White Queen and will be reviewing it. Hope to have the post up tomorrow! Hi again. Managed to watch in on sunday- not quite sure what to make of it so far. Its kind of in the middle for me- not brilliant by any means but entertaining enough as a sunday night drama. Hope to make my mind up by ep 2. Good morning. I just found out your page, and i red your posts regarding the Borgias, i enjoy them very much, and your blog is FANTASTIC! Permit me to ask you, are you aware of our Official SaveTheBorgias Fan Campaign ™?? We are dedicated viewers that love the series, and we decited to oppose to cancellation, having a “Sacred Cause”. To make a reality a Season 4! We created Our Fan Campaign, with hard work, effort, and giving our heart, devotion and free time, each and everyone of us, the Borgias Fans, without monetary support from anyone. Our Fan Campaign has already gain a big attention on media, and we are organizing new actions, constantly. Also, We are present in all main internet platforms, all relevant infos, in our tumblr page. We would very honored and happy, if you would like to “visit” our pages, learn all relevant infos, and decide to support our Cause. Also, we would grateful, if you could publicize our Fan Campaign and links, we need you all, the viewers of those excellent, high quality series to to save our beloved Borgias!